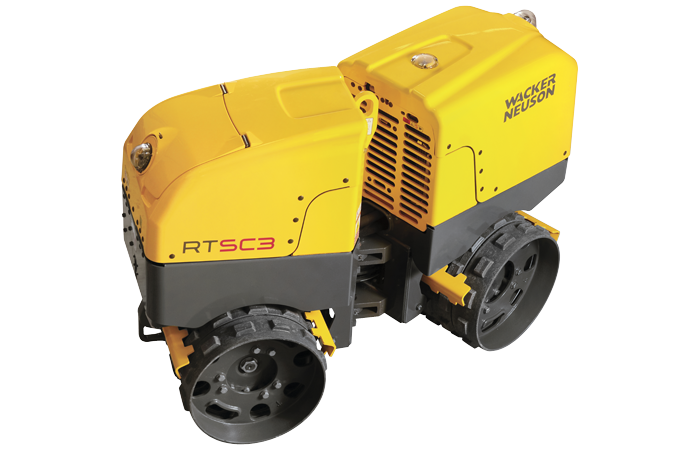 The RT trench roller with the SC3 infrared-remote control offers proven compaction results with safer operation. The smart control uses an infrared signal with line-of-sight control. The machine stops moving and vibrating should the line-of-sight be lost or if the operator comes within three feet (one meter) of the roller’s receiving eyes with the control box. The articulated trench roller offers below the axle exciter in each drum to allow for the efficient transfer of compaction energy to the soil for superior compaction results. Available with the choice of Kohler or Kubota engine. The RTx models are available with Compatec, the compaction control system that indicates the relative compaction level of the soil. Patented three receiving eye design eliminates signal loss from trench shoring while retaining the line-of-sight control of the roller. With 16 channel transmission, multiple rollers can be operated on the same jobsite without interference from one another. RTx model offers flexible drums that allows for convenient conversion from 32 in/82 cm to 22in/56 cm. The easy to remove extensions have a central mounting system that protects the bolts from exposure to damage during operation. The articulated joint increases maneuverability and the low center of gravity improves stability. 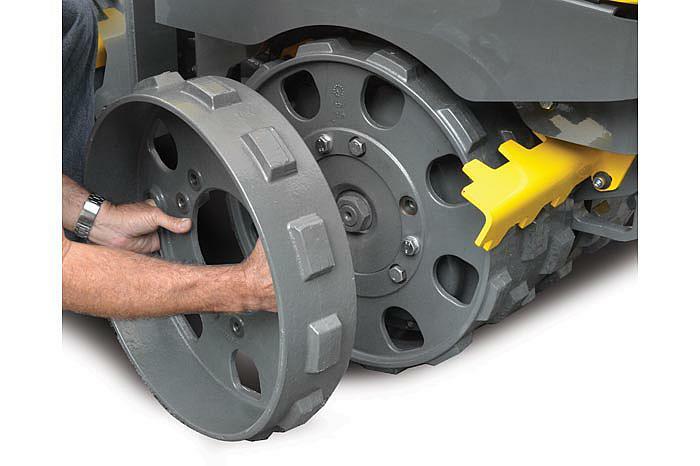 High and low compaction force provides flexibility depending on the job. The lower end is completely maintenance-free due to the self-lubricating design of the drive and the exciter. The engine control module with diagnostic LEDs monitors machine functions such as oil pressure, radiator level, engine temperature, glow plug, battery and air filter capacity for easy operation and troubleshooting. 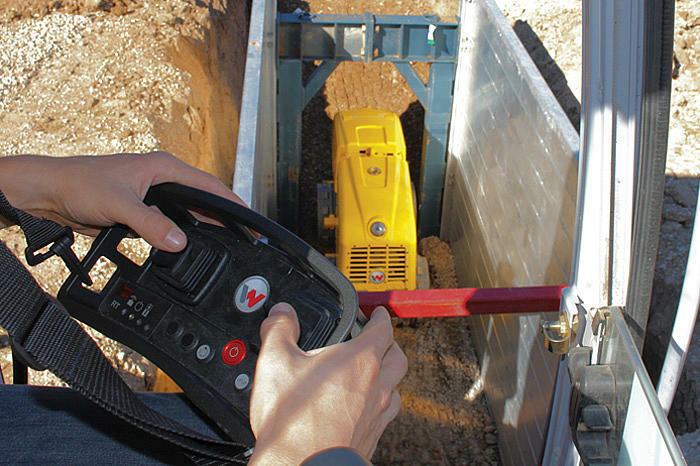 A prominently placed infrared receiving eye on top of the Trench Roller ensures that the remote control contact is maintained permanently, even in the trench shoring. Below the axle exciter in each drum: means more efficient transfer of compaction energy to the soil and improved stability of the machine. The articulated joint enables continuous operation around curved building segments. 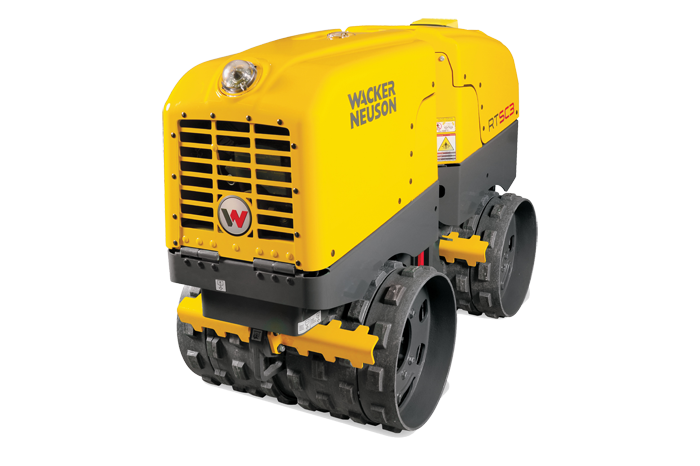 The RTx models are available with Compatec, Wacker Neuson’s compaction control. *RTx model drums can be configured for 32in (820mm) or 22in (560mm) width.